South Adelaide Panthers Football Club are a football (soccer) club from the southern suburbs of Adelaide, South Australia. 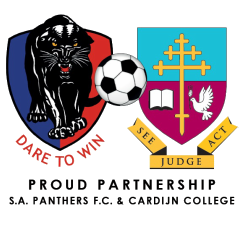 Panthers play in the FFSA South Australian Premier League. Their home ground is at the O’Sullivan Beach Sports Complex, known affectionately as Panther Park. was founded in August 1997 to provide opportunities for the advancement to senior level for players associated with the South Adelaide Colts Club. The club was originally an attempt to utilise and dominate the south as Noarlunga United and Seaford had limited success despite good youth talent in the area. The Panthers F.C. as they are affectionately known are great rivals of Noarlunga United & Seaford Rangers as a result of player movements, transfer politics and club proximity. When the club was formed it was jointly owned by the Sporting Star and South Adelaide Colts. The club’s initial games were played at the Cove Sports Community Centre – a ground known for its heavy winds. The club has since moved to the O’Sullivan Beach Sports Complex. In 2008 the club hosted a tournament to mark the passing of Tony Macentagert a club president at the time which they named after him inviting local teams from the area. Included were Seaford Rangers F.C., Noarlunga United F.C. and Hallett Cove F.C. (amateur club). South Adelaide beat Noarlunga on penalties in the inaugural tournament. The Panthers fielded young senior teams in the state league in 2011. Both the seniors and U/23’s made the finals that year with the U/19’s just missing out. In his first season as senior coach Steve Kitchen achieved promotion for the Panthers to the Premier League. The Panthers were relegated from the NPL in 2016 and are currently competing in the State League 1 competition endeavoring to gain promotion back to the NPL in 2018. Head Coach is former Club Captain and Club Champion Danny Graystone. Girls first joined the South Adelaide Panthers in 2005, when two teams, an Under 13 and an Under 15 team were introduced, bringing approx. 32 girls, and their families, to the club. These girls were named the “Pink Panthers”. The girls were introduced by Jim McGuinness and Sue & Phil Webster who identified a need for girls teams in the South of Adelaide as well as for their daughters, who wanted to play. Jag Kitchens (Jim’s employer) sponsored the U15 team for their strips and Complete Scaffold sponsored the U13 team for theirs, so there was no financial burden on the club. Since then Complete Scaffold has sponsored all girls teams.